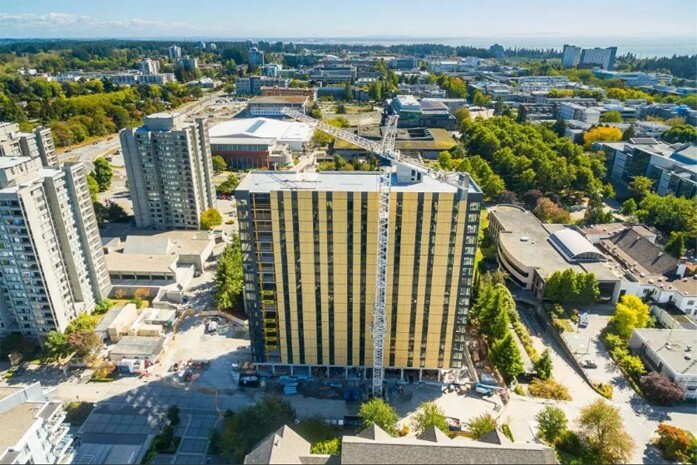 The world’s tallest wood building has just been built at the University of British Columbia (UBC). Standing 18-storeys tall (53 meters or 173 feet), the Brock Commons student residence is the first mass wood, steel and concrete hybrid project in the world over 14 storeys. Not surprisingly, Resolute is a great supporter of wood buildings and not just because they represent new markets for our business. Wood buildings also mitigate climate change by sequestering carbon in the lumber used, as well as by avoiding the emissions associated with construction materials like steel, concrete, brick and aluminium that require significant fossil fuel energy to produce. What does that really mean? Because wood is a sustainable building material that stores, rather than emits, carbon dioxide, UBC’s Brock Commons residence will lead to a reduction of 2,432 metric tonnes of carbon dioxide compared to other construction materials, the equivalent of taking approximately 500 cars off the road for a year. A 2014 Yale University study concludes that simply using wood substitutes in construction could eliminate 14% to 31% of global CO2 emissions and 12% to 19% of global fossil fuel consumption. Resolute is a member of the Forest Products Association of Canada (FPAC). FPAC has received a great deal of recognition for its “30 by 30” Climate Change Challenge, which commits the association’s members to removing 30 mega-tonnes of CO2 per year by 2030 – more than 13% of the Canadian government’s total emission-reduction target. With such a challenging goal, using more wood in the construction of buildings could make a world of difference to the environment.